Inside the hidden and mysterious world of North Korea, Joseph Kim lived a young boy’s normal life until he was five. Then disaster struck: the first wave of the Great Famine, a long, terrible ordeal that killed millions, including his father, and sent others, like his mother and only sister, on desperate escape routes into China. Alone on the streets, Joseph learned to beg and steal until finally, in desperation, he too crossed a frozen river to escape to China. A kindly Christian woman took him in and kept him hidden from the authorities. And through an underground network of activists, he was spirited to the American consulate, becoming one of just a handful of North Koreans to be brought to the United States as refugees. Joseph knew no English and had never been a good student. Yet the kindness of his foster family changed his life. He became a dedicated student, mastered English, and made it to college, where he is now thriving thanks to his faith and inner strength. 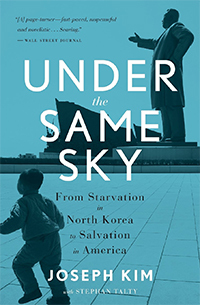 Under the Same Sky is an unforgettable story of suffering and redemption.